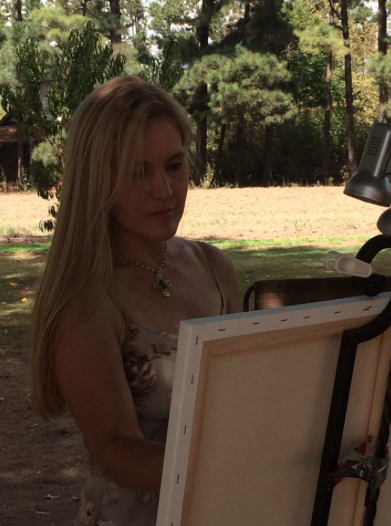 Capture the beauty of your wedding day with a “Caught on Canvas” painting. 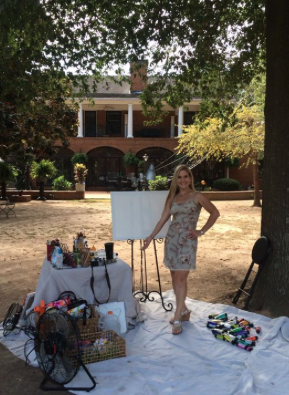 Amy Stone is a Live Event Painter who can paint on location at your wedding or special event. 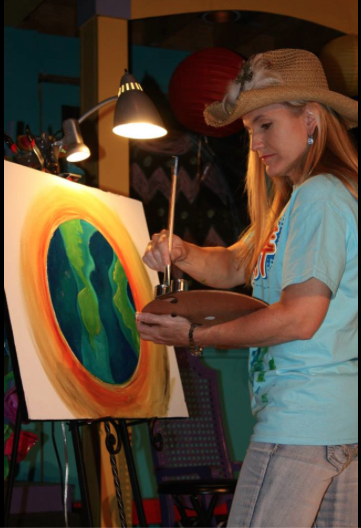 She is a full-time artist trained at Memphis College of Art, BFA 1994. 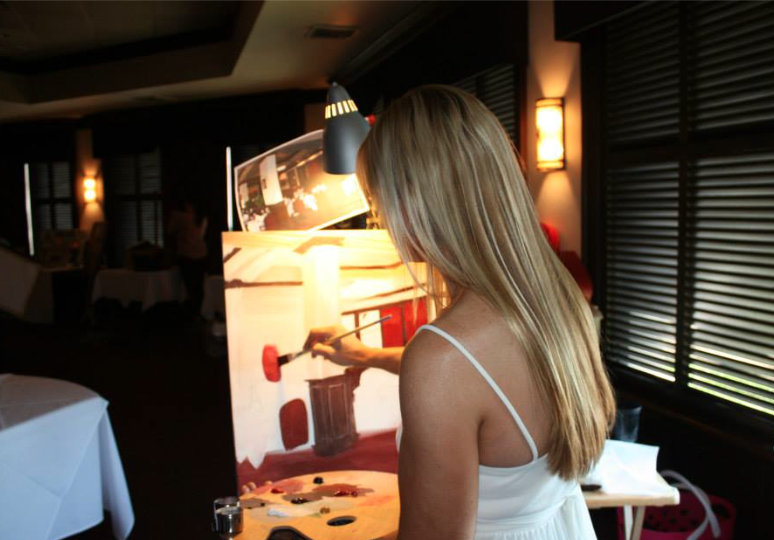 Your guests will love the entertainment of watching a painting unfold quickly before their eyes. 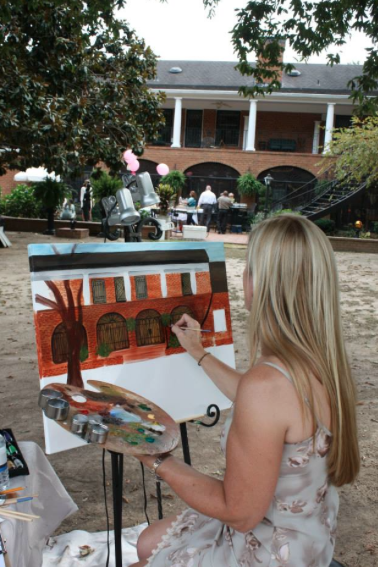 A live event painting not only adds an entertaining and unique touch to your wedding day, but is also a gift to be treasured for generations. 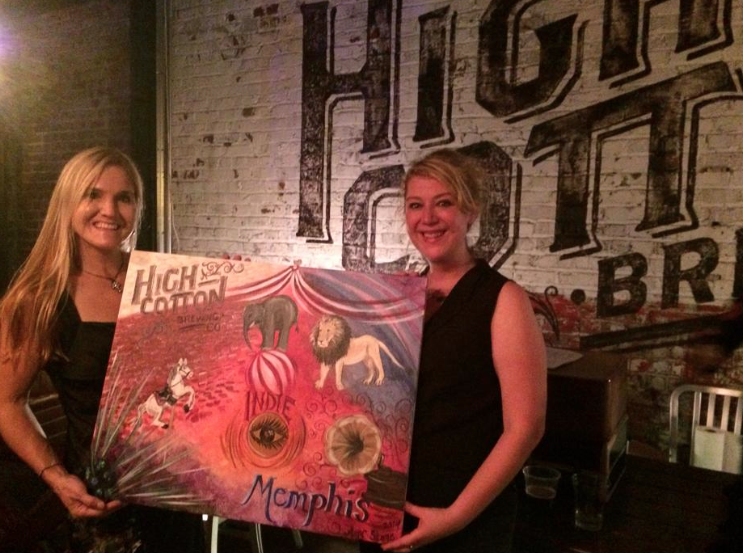 Live event paintings are also excellent fund-raising opportunities. 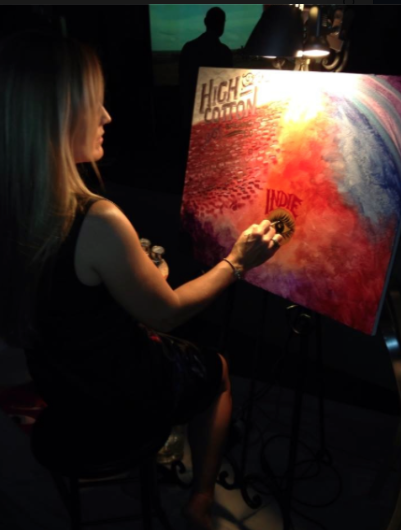 Guests enjoy watching a painting in progress and then bidding on it at the end of the evening. Ø Buyer is responsible for all shipping costs (if applicable). Ø Framing is not included. Ø Travel fee of 30 cents per mile round trip for areas 15+ miles. Ø Extra travel costs may include air fare, lodging and meals if the event is located outside the Memphis, TN area. Ø $250 deposit is due immediately. Deposit is considered non-refundable within 60 days of the event. Remaining balance is due the day of the event. Below is the Bridal Questionnaire and Contract. I can email this to you upon request. 3. Is there a specific theme to your event? 4. Do you have any special requests or preferences? 5. Is the event outside? What are inclimate weather plans? Please provide pictures/details of any alternate locations in the event of bad weather. 6. Is there a particular moment you wish to have captured on canvas? 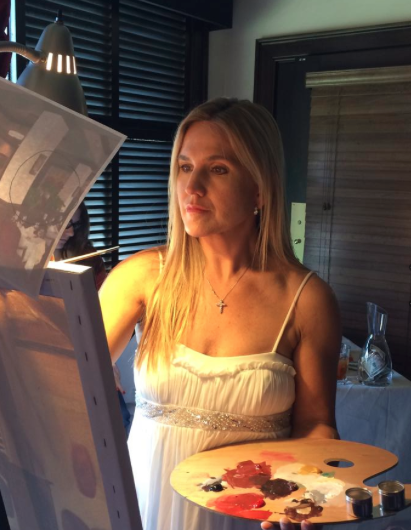 (First dance, cake cutting, ceremony, guests mingling at reception, etc) Or do you prefer the artist have free reign to choose all subject matter? 10.Which is most important to you? 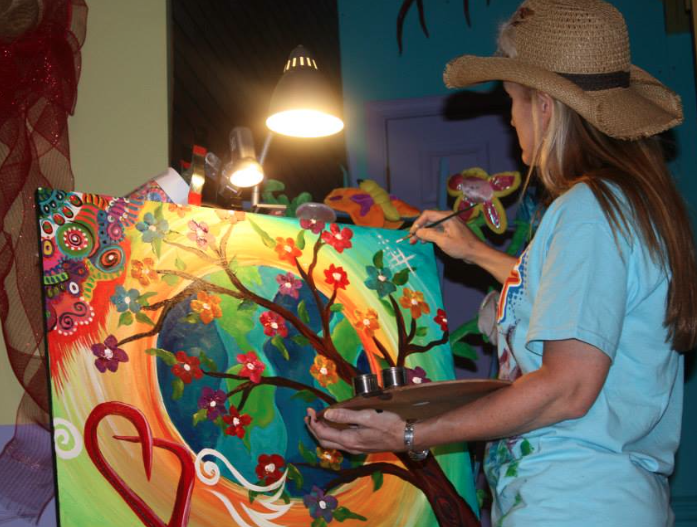 The entertainment/experience of your guests watching the painting unfold, or having a keepsake from your event. 11.Would you be opposed to me starting 2-3 hours early, or do you prefer I start with a blank canvas? 12.Would you be interested in your keepsake being taken to the artist’s studio for touch-ups and additional detail for an extra $400? The finished canvas would be ready for pickup/delivery within 4-6 weeks. 13.Are there any other details or information you wish to share? Ø In order to paint effectively, I will need at least a 6X6 space in a shady location (if outside) with a clear view of the focal point(s) to be painted. 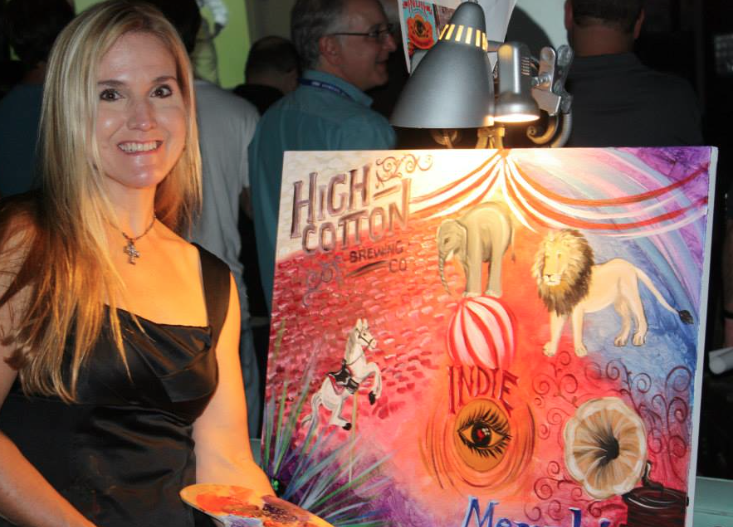 Please consider additional space around me and my canvas for guests to mingle and observe the painting unfold. I will also need access to electric for my easel lamp, and a water source. Ø For planning purposes, please supply pictures or simple phone video texted to 901-219-5864 or emailed to CaughtonCanvasbyAmyStone@Gmail.com of the venue/focalpoints, primary wedding colors and any special objects/requests. Supplying pictures of these items in advance of the event will greatly improve the outcome of your keepsake. You cannot send too many pictures, so snap away! If you would like to send me a link to an online photo album for this purpose that is fine, whatever is easiest for you. Ø As time allows, I can combine several focal points into the same painting and add cherished objects, etc, as requested. Please supply pictures in advance of the event. 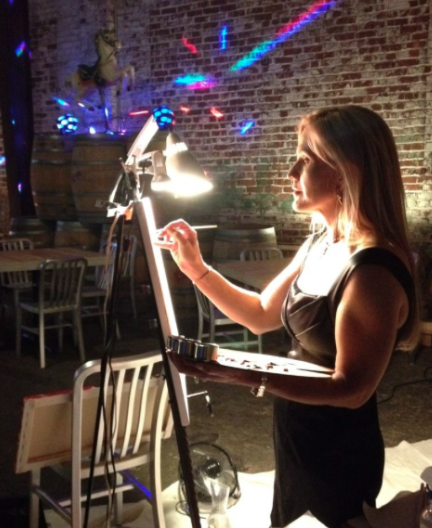 Ø My setup includes a large khaki-colored drop cloth, a small card-table covered with the same type drop cloth, an easel with lamp, and a small stool for my assistant. I bring extension cords for my lamp. 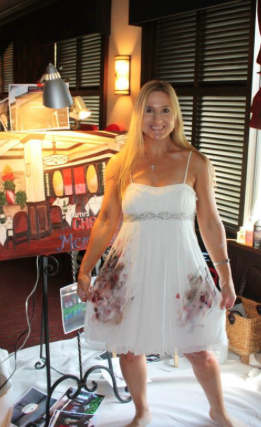 Ø I like to wear a dress that compliments the bride’s wedding colors, so please provide those details as outlined above. 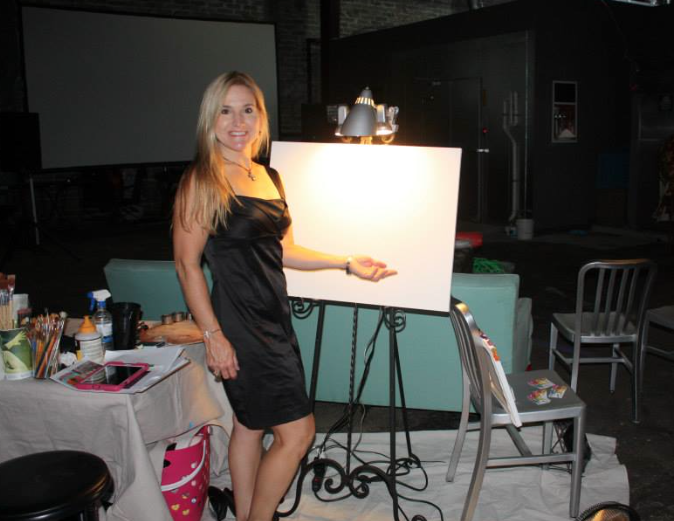 Ø I prefer to arrive 3-4 hours in advance of the event with my assistant (my beautiful niece) to get setup, plan out the canvas, get a feel for the space, details, atmosphere, and to paint the background. When guests arrive they can observe me painting details. Ø If you prefer me to wait on the guests to arrive and start with a blank canvas let me know. 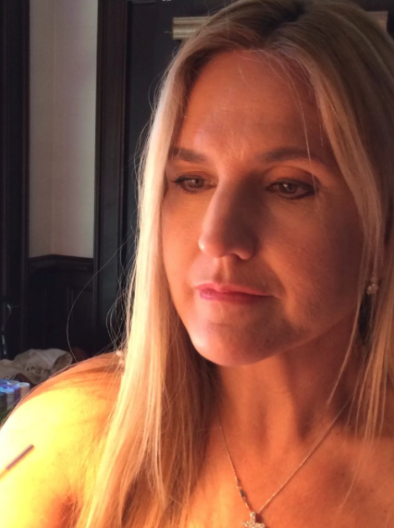 Please understand that waiting will affect the overall details of your keepsake. The option of taking the painting back to my studio for additional details/finishing is always open for an additional $400. 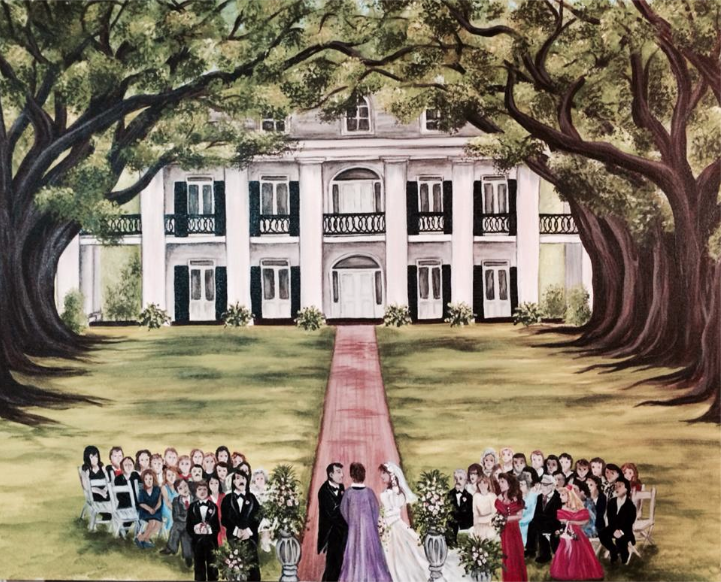 Ø If you are already married and would like a painting of your wedding, reception, or other event, I may be able to work from your photos. Please contact me for further information. I have read and understand the above information and requests. 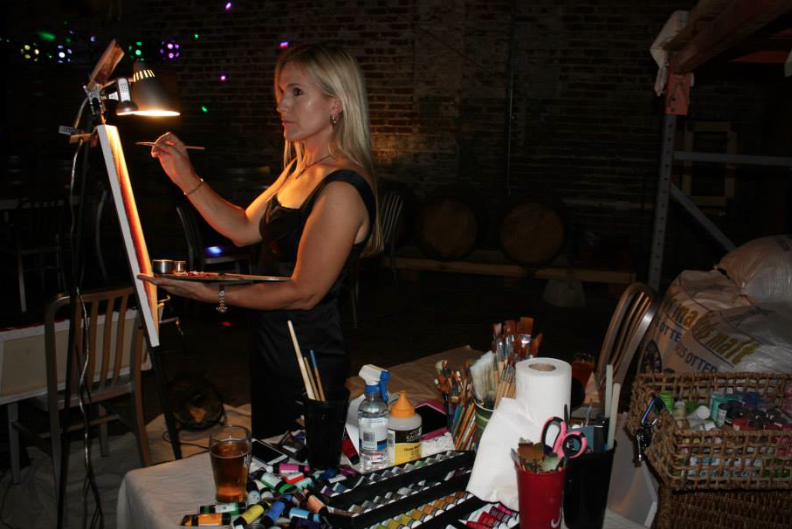 I am hiring Amy Stone, Live Event Artist, to paint at my ­­­­­­­­­­______________________________________ event on ____________________________for the agreed upon price of $­­­­­­­­__________________. A $250 non-refundable deposit is due immediately to hold my date and time. I understand that this amount is non-refundable 60 days prior to my event. 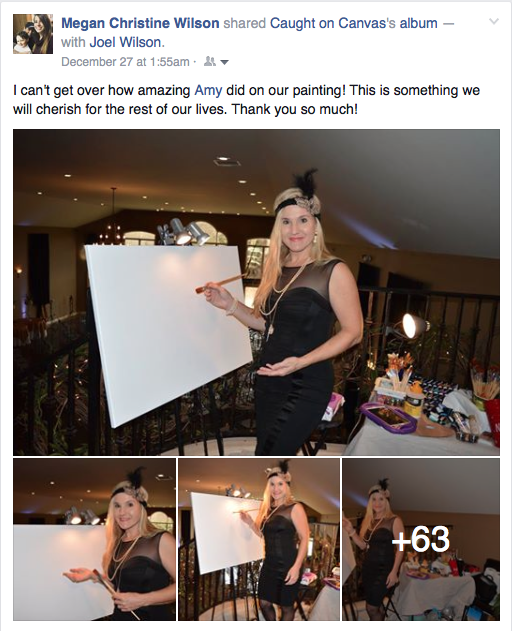 I will pay $____________________via cash or personal check made out to Amy Stone the day of the event. 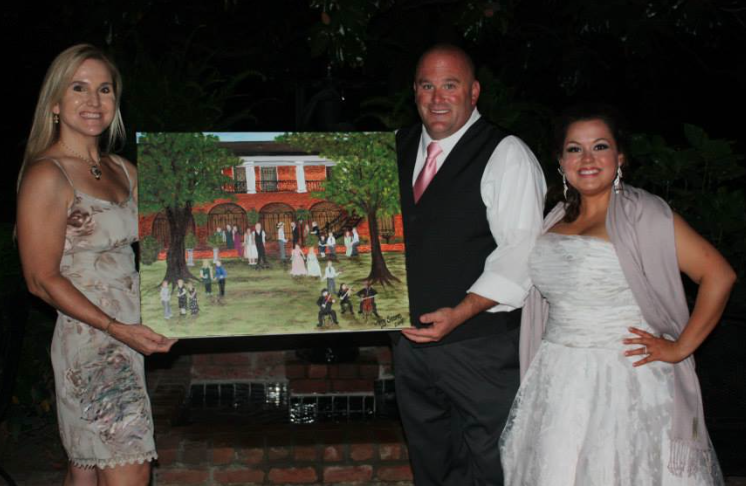 Presenting the painting to the bride and groom after 7.5 hours of painting.